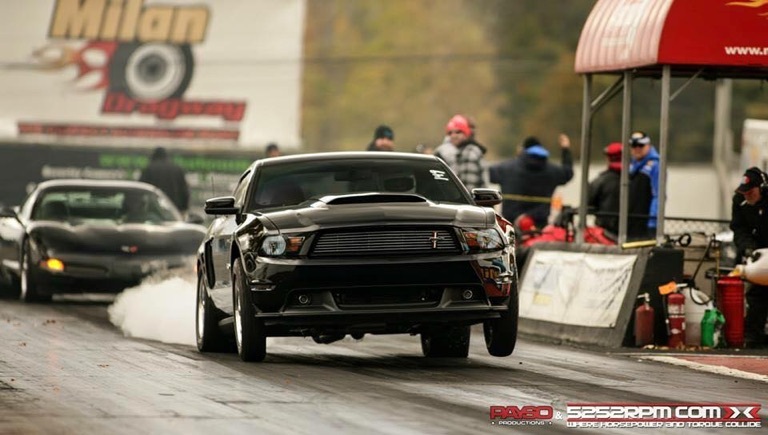 The Alternative Auto 2011 5.0L Mustang has had a slightly delayed start for the 2015 season. We made some changes with the car throughout the winter and early spring, but because of the shop work load and occasional bad weather, most of the summer got past us without getting some new upgrades and improvements sorted out on the 2011 5.0L car. But, finally in the late summer early fall ’15, several of the upgrades we did to the car had started to pay off. Most notably – for the track and limited street use, we are no longer rolling on the 20in wheels and tires. As impressive as we thought the 20’s with the MT drag radials were in the rear of the car… we simply found that the 20s just were not hooking the car consistently enough at most of the tracks we would go to. Sometimes they hooked like nails, and other times they would go up in smoke. So, we opted for a set of lighter 17in front runner type wheel, and a lighter 17×9.5 rear rim with an M&H 325/45/17 drag radial. We feel that the 17’s keep a tasteful and tuff look on the car, while still maintaining good stability all around. And, the M&H rear drag radials have already shown some nice gains in the 60ft so far with a best of 1.36. 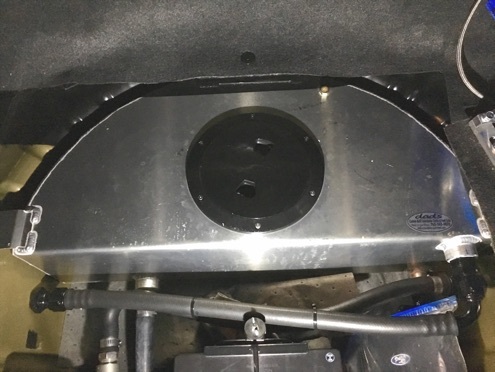 For motor and performance increase, we’ve upgraded to an 8-rib blower belt system, and also installed the better flowing VMP TVS blower housing. This has bumped our boost to about 16-17psi for the 2015 season. RWHP is now 810rwhp on boost only. NOS has not been used this season as we’re trying to squeeze more out of the car with Boost-only. We’ve also installed a water/ice tank in the trunk for better inlet air temp management while at the track. The Roush front mount heat exchanger is still intact and working normal. So the car can still enjoy lots of street driving with normal type intercooler temps around town… but seriously chilled with ice when at the ¼ mile. For 2015, the car weighs about 125-lbs less because of the new wheels and tires. It’s still sitting at a little over 3800lbs with driver. Unfortunately, the ice/water tank and all of its related hardware and plumbing has added about 65lbs. 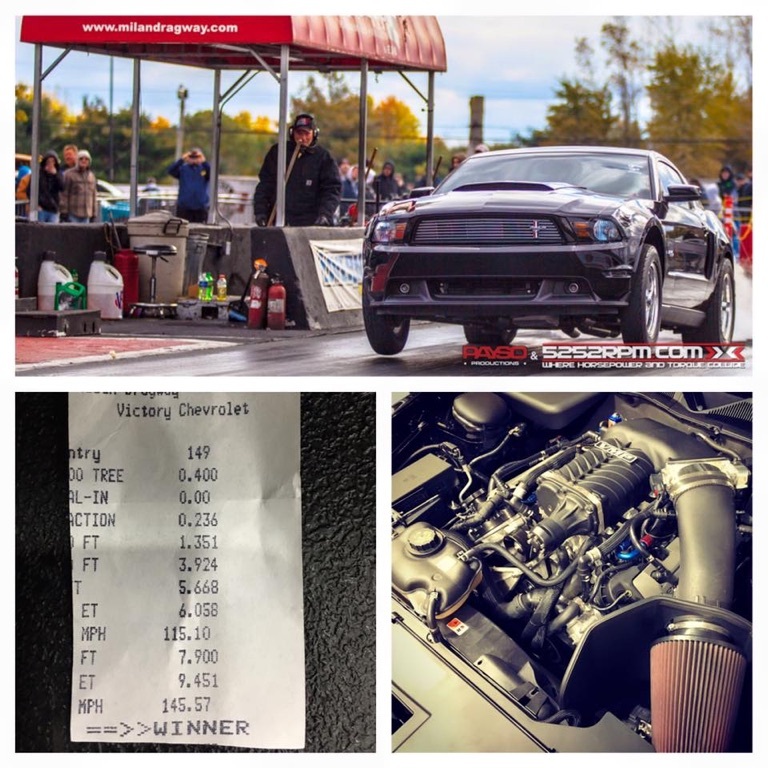 Best ET so far at the end of the 2015 season on boost only is a 9.45 @ 145mph with a impressive 1.35 60ft. And, as a recap on other aspects of the car; weighs just over 3800lbs,, front and rear suspension is still totally stock…. not one part has been changed! Still has a 3.55 gear in the axle, and still has the stock TQ convertor as well in the stock 6-speed automatic transmission. This car couldn’t be easier to drag race and maintain. Just a simple foot brake off idle and floor it!, no lag, no complicated trans brakes or anything! Just lots of instant and insane TQ from 1500rpm all the way to 7500rpm. As a final note, the original 6R80 automatic trans has still never let us down. It’s never been apart, and so far not showing any signs of trouble with a ton of passes and big power with boost going through it for 4 seasons. Plans for 2016 are Stage-2 Comp Cams, and a freshen up for the motor. 9.45 @ 145+ mph in the 1/4 mile on BOOST ONLY!!! !